Many of the Opry staff musicians have lost irreplaceable instruments, amplifiers and more in the flood, but they carried on nobly, battered but unbowed by the tragedy and everyone played straight from the heart all night long. 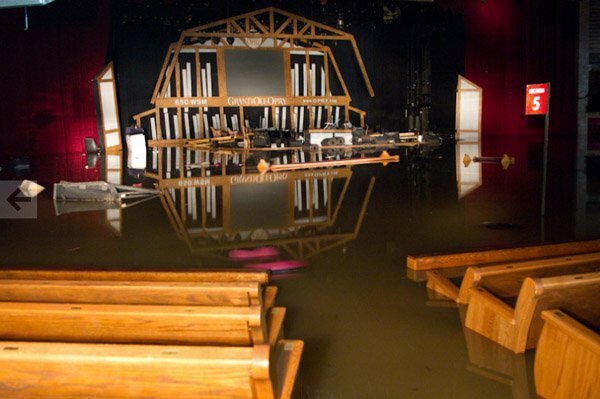 Performers included Chris Young, Suzy Bogguss, Restless Heart, Jack Green, Jim Ed Brown, Jimmy C. Newman, and Jeannie Seely, who had lost “everything” in the flood. All of them sang with passion and commitment befitting the occasion and then some. cast singing “Will The Circle Be Unbroken”, it was clear to all in attendance that this was the beginning of the healing process our city so desperately needs. I also must tip my hat to all the Opry management and staff who have showed so much class during this extremely difficult time. As President of the Nashville Musicians Association, I am so proud to represent the finest musicians in the world and I know that “Music City” will persevere through these hard times and emerge stronger than ever before. This entry was posted on May 6, 2010 at 11:32 pm and is filed under Uncategorized. You can subscribe via RSS 2.0 feed to this post's comments. You can comment below, or link to this permanent URL from your own site.